This brand has some of their products distributed nationally (ricotta cheese & cream); the rest are mostly found in New England to Florida and as far west as Chicago. Grass-fed 75 Labels dairy products "grass fed.” Seven farms are 100% grass fed but the others do feed some grain. 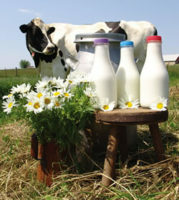 Suppliers are required by the brand to make pasture the main source of the dairy cows’ diet. Soy Free Ration? 15% of the farms supplement with some soy; others feed no soy. Times Milked 92 Most supplier farms milk twice a day (standard protocol on legitimate organic dairies), but some milk only once a day.